Possums like to eat fruits, plants, seeds, buds, and small vertebrates. Nearly all possums including opossums are omnivores but most of them are vegetarians. Possums likely supplement their primary diet with rodents, snails, frogs, insects, mice slugs, scorpions, rats, birds, eucalyptus, and pollen. They are generalist feeders. Let’s see in detail as to what do possums eat in winter as well as in summer. The common brushtail possum is a forest-dwelling species. It prefers to consume shoots, seeds, eucalyptus leaves, and flowers. Additionally, the possum also feeds on birds’ eggs, insects, chicks, and small vertebrates but only sometimes. Common brushtail possum has the most generalized diet of all possums. It prefers to feed on plants matter. Australian mistletoe is the most favorite food of a brushtail possum. Possums are known to eat large proportions of eucalyptus leaves, ferns, grasses, fruits, mosses, and herbs. The possum can also eat highly toxic leaves. 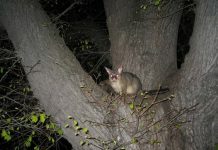 Unlike koalas, brushtail possums are probably the only arboreal marsupials to feed on different types of plants during their foraging journey. The possum’s teeth aren’t really developed to cut hard eucalyptus leaves but they do manage to chew food such as herbs quite efficiently. The eucalyptus leaves aren’t nutritious for possums. 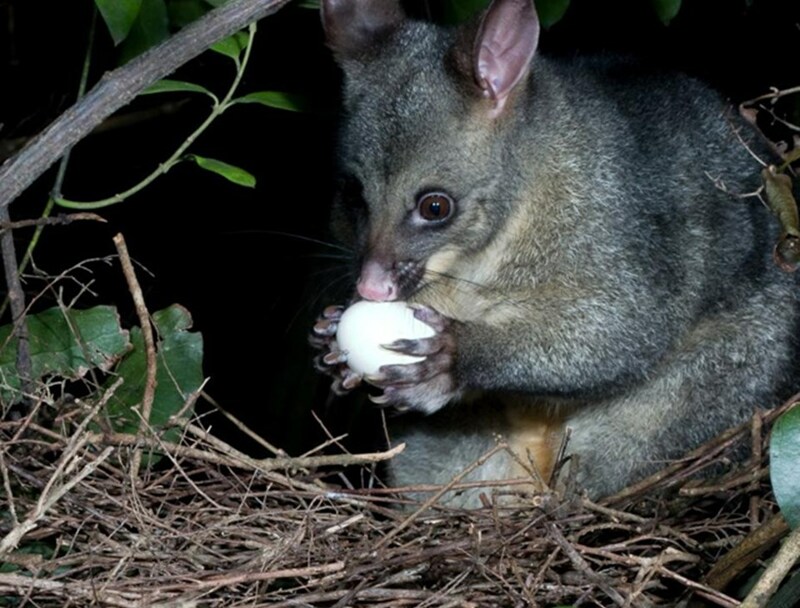 Dig Deeper: What Fruit Do Possums Eat? The essential component in a mountain pygmy possum diet is a Bogong moth that makes up 30% of its overall diet. The possum loves to feed on the moth species (Agrotis infusa) particularly in spring or summer when moths are abundant in alpine mountainous regions. Mountain pygmy possum can supplement its diet with seeds, buds, and fruits. They will also consume mountain plum pine, snow beard-heaths, fruit-bearing conifer, and blackberry Rubus spp. The possum doesn’t start eating food straightaway. It smells the food first before holding it with its incisors. 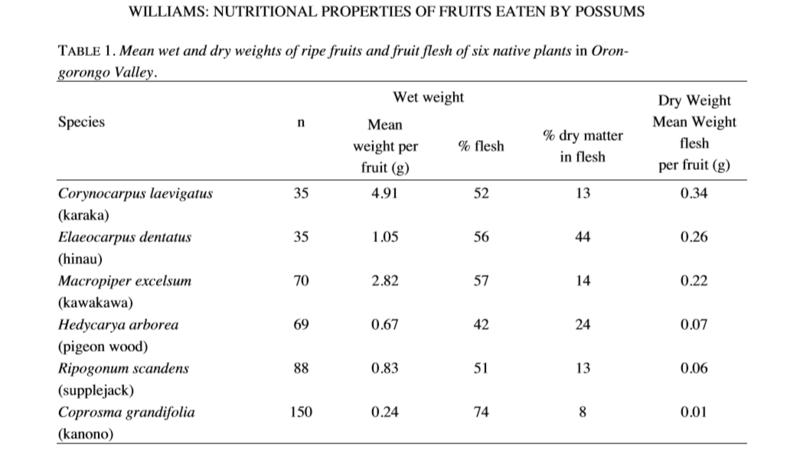 Like most possums, Tasmanian pygmy possums have omnivorous diet. They will feed on small animals such as lizards, spiders, and insects. Additionally, possums also eat pollen and nectar. Although they fancy eating pollen they do not destroy the host flower. The western pygmy possum largely eats pollen and nectar from eucalyptus and melaleuca. It is thought to play vital role in pollination too. The possum also feeds on insects. Possum eating an egg in the domestic garden. 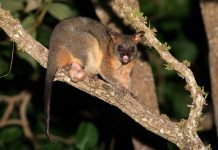 The Northern brushtail possum likely feeds on leaves, seeds, flowers, fruits, and many other plants matter. They do not hesitate to feed on toxic plants. Possums will supplement their diet with moths, birds’ eggs, grubs, snails, and baby birds. They are most likely to be found in near urban areas primarily because their primary foods occur in gardens. The mountain brushtail possum mostly eats Acacia species and its most favorite food is Acacia dealbata. For those possums that live in lowland habitats, their diet primarily consists of eucalypt species. Possums also consume epigeal fungi. What Do Australian Possums Eat? 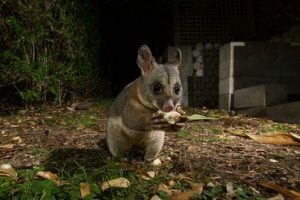 What to Feed Possums in Captivity? The captive possum will eat just about anything ranging from vegetables to chicken. You should feed your possum 75 to 80% veggies and 20 to 25% meat. The healthy foods probably include boiled chicken, chicken legs, chicken feet, quail eggs raw, and dog kibble. You can also feed your possum peanut butter which it probably loves to munch on. Do not feed your possum pork or a meat. Geiser, F. (1987). “Hibernation and Daily Torpor in Two Pygmy Possums (Cercartetus Spp., Marsupialia)”. Physiological Zoology. 60 (1): 93–102. JSTOR 30158631. Harris, J.M. (2009). “Cercartetus lepidus (Diprotodontia: Burramyidae)”. Mammalian Species. 842: 1–8. doi:10.1644/842.1. H Tyndale-Biscoe. (2005) Life of Marsupials. pp. 250-58. CSIRO Publishing. “Trichosurus vulpecula — Common Brush-tailed Possum”. Encyclopedia of Life. Retrieved 24 October 2017. Wellard GA, Hume ID (1981) “Nitrogen metabolism and nitrogen requirement of the brushtail possum, Trichosurus vulpecula (Kerr).” Australian Journal of Zoology 29:147-57. Harris, J.M. (2009). “Cercartetus lepidus(Diprotodontia: Burramyidae)”. Mammalian Species. 842: 1–8. doi:10.1644/842.1. Menkhorst, Peter (2001). A Field Guide to the Mammals of Australia. Oxford University Press. p. 88. Milich, K. (2002). “Trichosurus arnhemensis”. Animal Diversity Web. Retrieved 2008-04-18. 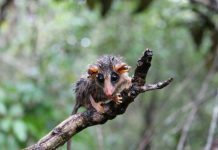 “Top 10 Facts About Possums in Australia | Bird Gard Australia”. Bird Gard Australia. 12 February 2015.